Home » Almighty God's word , believe in God , Gospel , Grace. 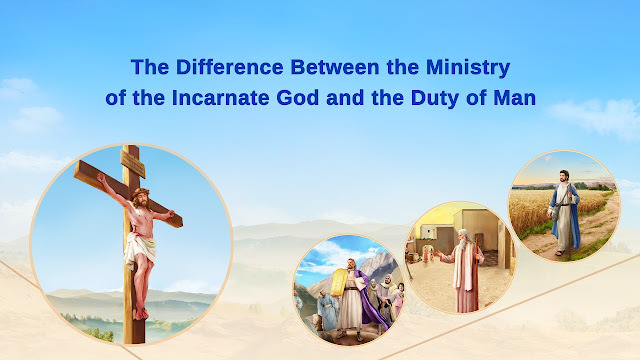 , Lord » Almighty God's Word "The Difference Between the Ministry of the Incarnate God and the Duty of Man"
Almighty God says, "Whether the incarnate God speaks, works, or manifests wonders, He is doing great work within His management, and such work cannot be done by man in His stead. The work of man is only to do his duty as a created being in a given stage of God’s work of management. Without such management, that is, if the ministry of God incarnate is lost, so too is the duty of a created being. God’s work in carrying out His ministry is to manage man, whereas man doing his duty is the performance of his own obligations to meet the demands of the Creator and can in no way be considered to be carrying out one’s ministry. To the inherent essence of God, that is, Spirit, the work of God is His management, but to God incarnate wearing the external form of a created being, His work is the carrying out of His ministry. Whatever work He does is to carry out His ministry, and man can only do his best within His scope of management and under His leadership."